Last night, the Hamilton Chamber of Commerce hosted a talk at Liuna Station by Jennifer Keesmaat, Chief Planner for the City of Toronto and one of the most highly regarded planning professionals in North America. The theme of this inaugural event was The Ambitious City, and Keesmaat distilled a set of "timeless principles of city building" for how to create a great city. Keesmaat grew up in Hamilton and spoke about waiting for the bus on the west mountain and carrying her bike up the Escarpment stairs. "Maybe this city inspired me, but it also made me tenacious, persistent, determined." To make great neighbourhoods work, people need a variety of ways to get around: walkable streets, bike lanes and good transit as well as automobile lane capacity. "If you do it right, you will encourage people to choose other ways to get around." Keesmaat said that in her Toronto neighbourhood, "I have lots of choices [on how to get around]. Interestingly, living in a place with great choices, my car started coming in third" after walking and cycling. In contrast, car-dependent land use reduces social inclusion. "If you're always just getting in your car and driving, you don't have a sense of value for your neighbourhood." To achieve the diversity and scale that make great neighbourhoods, great cities need density. "You need to bring places in close to make this a viable way of life." She noted that density does not necessarily mean towers. "Some of the densest cities in the world are midrise." Midrise density also integrates more coherently with existing lower density land use rather than towering over it. 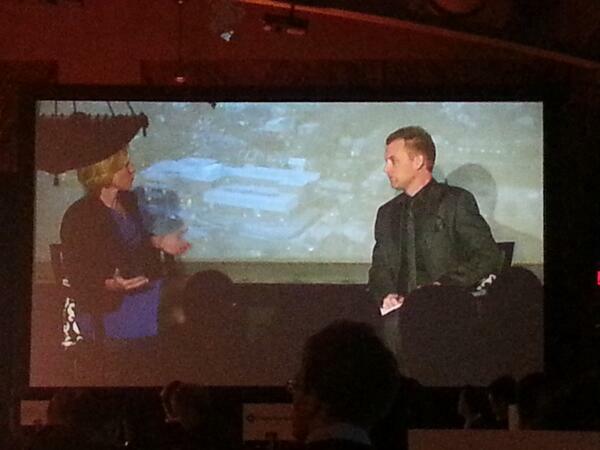 Next, Keesmaat argued that in great cities, design matters. "The quality of our public realm says something about what we value." Part of setting high standards is ensuring that heritage is not demolished for short-sighted interest. "In great cities, heritage preservation and restoration is recognized as adding long-term value." She cited the famous Jane Jacobs quote, "New ideas need old buildings." With more people living in cities, the city becomes the environment. "Great cities value clean air and water." An important way to reduce pollution is to transform how people choose to travel. "So much of our environmental footprint is generated by how we move around." She noted that the North American city with the smallest per capita environmental footprint is New York, a dense city in which people walk, cycle and use transit for a large proportion of trips. "Great cities treat land, air and water as precious scarce resources." Of course, a city that follows all of these principles will become more desirable and hence more expensive. Keesmaat advised, "Great cities plan for affordable housing." This necessarily involves public policy and public money, as market forces by themselves will not ensure that housing within a prosperous city remains affordable and accessible. "We need innovative solutions to our affordable housing problems." 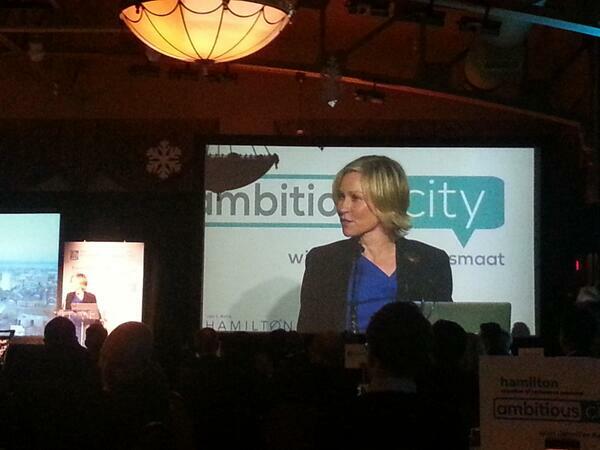 Keesmaat did not shy away from a blunt and measured critique of how Hamilton has been doing on these principles. She spoke of the "classic mistakes" that Hamilton has made - classic because many other cities have made them as well. Her number one criticism was Hamilton's ongoing commitment to designing our streets around easy motoring. "You've made your downtown streets a great place to be for cars," with the result that they are not a great place to be for people. "Will your downtown be a place that you move through or will it be a destination - a place to go to?" She called Jackson Square a classic mistake: a mall turned in on itself that swallowed several whole blocks, created dead zones and eliminated transportation routes through downtown. The next classic mistake is Hamilton's ongoing dedication to sprawl. "You've continued to grow out and you're continuing to grow out today." This produces two problems. First, it means the City is spending scarce public dollars on the most expensive infrastructure that produces the poorest return in terms of new economic activity. "You've built very costly infrastructure at the edges of your city." Second, it means the city's focus is being drawn away from the centre. "In order to make your downtown work, you need to be really disciplined about your other uses. The energy is still moving outward to the edges of the city." The good news is that it's still possible for Hamilton to recover from these classic mistakes - but it will not be easy. "City building is difficult and it demands tenacity." With its many assets, Hamilton enjoys a lot of potential, but we still haven't tied those assets into a coherent, strong vision that will lead to greatness. "You haven't hit the tipping point yet." The first thing we need is to transform how the city invests in infrastructure. Specifically, the city needs to start investing in the kind of infrastructure that will attract 18-34 year olds - the people who will energize the economy for decades to come. "You choose, as a city, economic prosperity by building places that attract the coveted 18-34 demographic." What 18-34 year olds don't want is the suburban, car-dependent lifestyle to which their parents aspired. "They want to walk, bike, take transit. They don't own cars and they don't want to mow the lawn." Because Hamilton is still focused on sprawl, we risk missing out on attracting this demographic. "The majority of your new housing units are still single family houses. You won't attract the 18-34 demographic if you don't build the housing they want." To achieve the political change needed to make this happen, the city needs to "widen the tent" and cultivate leadership from all sectors of the city. "It's not enough to generate great plans. It is imperative to build capacity for engagement." This engagement needs to be creative to reach a broad section of stakeholders. "There's many people who will never show up" to a public meeting, but they need to be engaged in other ways. "We need to find new ways to bring [more people] into the conversation." After the talk, Keesmaat sat down with moderator Martinus Geleynse, publisher of Urbanicity Magazine, for a question and answer session. Asked why people in suburbs should care about what happens downtown, Keesmaat replied, "There's a flaw in the question. We don't divide very well into urban vs. suburban" but rather many people live, work and play across both spaces. 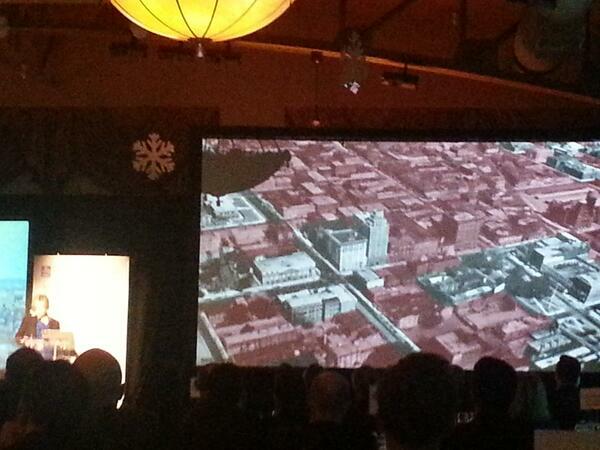 "When you create the downtown as a true centre, it becomes a centre for all." Asked about Hamilton's prospects at becoming more of a bedroom community for people working in Toronto, Keesmaat replied, "It doesn't create a very high quality of life if you spend a long time commuting from city to city." She said Hamilton needs to keep cultivating diverse employment opportunities so people can find jobs here. Keesmaat also contested the claim that the continued focus on sprawl reflects market demand. "Sprawl is not market demand, it's the result of a planning process" that incentivizes low-density greenfield development by building expensive suburban infrastructure and not charging enough in development charges and property taxes to cover it. "You're probably subsidizing sprawl more than you're subsidizing affordable housing." Asked whether the private sector or the public sector needs to move first toward building a great city, Keesmaat was emphatic: "It is imperative for the public sector to lead and instill confidence for the private sector" to follow. She cited three key elements that make change possible: you need to believe in the vision, understand how great cities work and engage the broad public to realize change. Keesmaat cited adding bike lanes and "building a culture of respect for cycling" as low-hanging fruit the city can achieve very quickly. More low-hanging fruit can likely be found in the research, entrepreneurship and youthful energy at Mohawk College and McMaster University. "You need to connect that to city building." A third piece of low-hanging fruit is simply getting more children to walk to school. It's no coincidence that the rise in childhood obesity exactly matches the fall in children walking to school, and reversing the trend is as simple as encouraging active transportation to neighbourhood schools. Finally, Geleynse noted that many of the changes she recommends will take a long time. "Do we have to be patient?" Keesmaat was adamant. "No! Don't be patient. Be bold. You have to be bold and choosy. You have to set very high standards and don't settle." Her closing recommendation: "Go after light rail transit. It's a total game changer." The full video runs an hour and 47 minutes and includes moderation by Urbanicity publisher Martinus Geleynse and an introduction by Hamilton Chamber of Commerce President Keanin Loomis. Step One: vote in a council next year that values the necessity of attracting the 18-34 demographic. Our current council is doing an amazing job at attracting that demographics grandparents. On the bright side, we're apparently half-way to an 8-90 city. The lower city is already attracting young families in their 30s ... judging from the neighbourhoods I've lived in the past 3 years since moving from Toronto. It seems that younger families are moving in as older residents pass away or move out to retirement homes or to live with family elsewhere. Our local elementary school has 5 kindergarten classes (they mix junior and senior kids, 4 and 5 year olds together, so the cohort is probably about 60 kids). Ward 1 and 2 already have councilors that for the most part are pushing a progressive urban agenda. I can't comment on the councilors for Wards 3 and 4. The problem, from what i've seen, is lack of city-wide or regional vision ... you need a slate of candidates, including for mayor, who can connect the dots for people across the city. As for Keesmaat ... i agree with much of what she says, though in terms of "classic mistakes" i'd say those are the things you do because everyone else is doing them at the time. Every generation looks at previous ones and says the same thing. We seldom think that what we are doing is going to create problems that the next generation will have to fix, but that has been a pretty consistent theme in history, urban or otherwise. This isn't a generational thing, it's a matter of understanding how cities work and thrive, or not. In the 1970s, Toronto had already recognized that it was making those "classic mistakes" that most cities were making, and a reform council led by then mayor David Crombie acted quickly and with bold vision to start to reverse them: things like rezoning the downtown for high density mixed use (including residential), protecting heritage buildings, investing in more and better transit, and so on. As a result, Toronto's downtown has been booming, while the car dependent suburbs are comparatively languishing. That's why initiatives like the Eglinton Crosstown LRT are so important: the more suburban-style neighbourhoods need anchors to help them incrementally urbanize by integrating new high quality mixed use density and making their streets more pedestrian-, cycling- and transit-friendly. Four decades on, in Hamilton we're still debating whether the classic mistakes are even mistakes! It is a generational thing. I don't mean that to imply a kind of relativism or to suggest we shouldn't fight to fix problems as we see them. It's more a cautionary sensibility i learned from studying urban and suburban history ... the specifics change, but our tendency to use the past or "timeless" principles as a stick to beat the present doesn't. There are always people who will debate whether a mistake is a mistake ... my point was that yesterday's solutions tend to become today's problems. I take your point about Crombie and the reform council in Toronto. But remember that at the time the province was willing to fund most of the cost of the Queen Street subway ... roughly the equivalent of the current Downtown Relief line. It was opposed by reform councilors, and most stridently John Sewell. Toronto planners working on the new Central Area Plan debated whether the line should be moved to either Eglinton or Sheppard. I once interviewed Richard Soberman about the Metro Toronto Transportation Plan Review done in the mid-1970s. He made it clear that reform politicians and their planning allies pushed for the Sheppard option because they wanted to decentralize office employment growth away from downtown. They were reacting against the office boom of the 1960s and early 1970s, which they feared was putting too much redevelopment pressure on downtown residential neighbourhoods. They envisioned that pushing office employment to suburban centres would result in concentrated decentralization that would reduce commuter congestion by moving work closer to people in the suburbs around Toronto ... 40 years on for a complex set of reasons it has created employment sprawl more than anything else. And employment sprawl is far more problematic than its residential equivalent ... residential densities are steadily rising across most of Toronto's postwar suburbs, and even in the 905 (unevenly), but employment continues to decentralize with a few exceptions (there is hope that mobility hubs around GO Stations will slow or reverse this, and downtown Toronto has started to add office space since 2005 after a decade and half of near total stagnation). 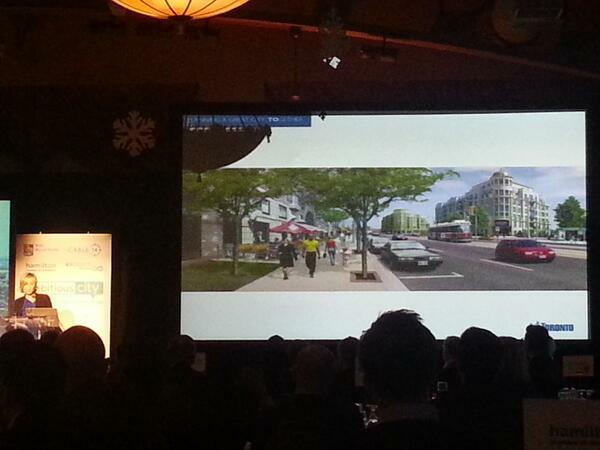 When you speak of incrementally urbanizing suburban-style neighbourhoods, I assume you mean along the Avenues. The reality is that reurbanization or suburban retrofitting is limited to mostly former industrial sites (brownfields) or strip plazas and underperforming malls (greyfields). Everything else is largely protected from change in the current official plan. There is hope that the Eglinton LRT will spur the owners of power centres in Leaside and along Scarborough's Golden Mile strip to intensify the use of parking lots by adding high-density housing or office space to the mix. A former Scarborough planner told me one reason for allowing big-box development on the former GM van plant site in the 1990s was that if a townhouse project was approved that would be it in terms of intensity of use ... big-boxes can be more easier redeveloped if land values rise enough to warrant it. What disturbs me is that for all the rhetoric about mixed-use what I've observed in practice is a lot of suburban infill projects where residential density is added with minimal improvement in terms of mixed use. Some retail is added at street level, which is an improvement. But overall a lot more residential than employment space is added. Though it is difficult to calculate, from a district level perspective it is likely that some inner suburban areas are less mixed-use now then they were in the 1960s and '70s as their industrial jobs are gone. White-collar employment was once expected to replace these jobs, but new office development has been virtually non-existent in inner suburban Toronto since the late-1980s ... the economics don't work, it doesn't have the centrality and regional transit infrastructure of the downtown core to drive rents, nor the lower cost structure of the 905 (which has much lower non-residential tax rates). Actually, I bet their grandparents would appreciate complete streets. It's their parents - the ones who are still in denial about ever getting old and losing their licenses - who can't conceive of anything beyond the status quo. Step Two: Encourage ballot-casting among 18-34 demographic, whose grandparents are twice as likely to vote. Totally agree. The 18-34 year olds need to vote or it will be same-ol'-same-ol'. But are 18-34 year-olds choosing to live in the wards which most desperately need better leaders? two urban wards versus 13 sub/exurban+rural is impossible math, even if we manage to elect a progressive mayor. Going off the City's ward profiles, the 20-34 bloc represents around 95,000 of the city's entire population in 2006. Total turnout at Hamilton's 2006 municipal election was around 127,000. About 55,000 20- to 34-year-old Hamiltonians live outside of the lower city. That's the problem. The 18-34 demographic we're trying to attract doesn't live here yet, and the decisions we've been making don't do enough to make Hamilton a more desirable place to move and settle. Sure they do. You, me, and and I are a part of it. Our demographic is just disinterested in politics and community involvement. Change that, and everything will come with it. Did some quick math based on StatsCan 2011 census data. Total population of the Hamilton area: 721,050. Total number of people 20-34: 134,415. That equates to 18.64 percent of our population. So about 1 in 5 are already here. What are you planning on changing the percentage to? Oft-quoted Portland has 157,298 in that age bracket, out of 583,776, making that 26.94 percent; however, they are in a state of just under 4 million, whereas we are in a province of over 12 million. Not to mention, we have the most populous city in the country in our province, as well as our federal government - Oregon has neither. I've been doing a lot of looking into these stats - freely available at both http://quickfacts.census.gov/qfd/states/41/4159000.html and http://www12.statcan.ca/census-recensement/2011/as-sa/fogs-spg/Facts-cma-eng.cfm?LANG=Eng&GK=CMA&GC=537, and it's not so much an apples-to-apples comparison as some would have you believe. This is great - but the pessimist in me can't help but think this is just another in a lonnnnng line of experts who the city can carry on ignoring. Were any councillors in attendance? It seems like not only will the horses not drink, we can't even lead them to the water. We have a long way to go before this kind of stuff sinks in to their heads. They gleefully vote in favour of sprawl - see aerotropolis where they fought against the province and citizens for the right to waste half a billion dollars on land that won't bring any commercial taxes in - and which the city has to pay for from its own pocket. At the same time they drag their feet about LRT, bemoaning the cost (even though it was going to be hugely subsidized by metrolinx) and being terrified that some single occupancy commuters might have to sit at some more traffic lights. I don't think the current council could do a worse job even if they tried. It's almost as if someone is giving them personal bonuses every time they make a decision that's bad for the city. 2 Councillors attended. Jason Farr and Brian McHattie - two wonderful, progressive and intelligent men, but NOT the people that needed to hear this message. What we're going to do is take Keesmaat's 7 principles of great city building and send them to every Councillor. We're going to ask them if they agree or disagree with the principles, and if they agree with them, what they're going to do to make those principles come to life in Hamilton. If they disagree, we need to ask what THEIR principles of City building are, and what evidence they can offer to support their decision. We, as a city, need to move past the politics of "no". We need to stop having discussions that centre around what won't work, what can't happen here because it's too costly, and start asking what they are saying "yes" to. Because if they're saying "no" to new proposals, they're implicitly saying "yes" to the status quo, and so we need to get them to think about what that's going to mean in 5, 10 and 15 years for our city. I hope they are willing to answer. I have said for a long time that council is far too good at saying "no", and terrified of saying "yes" to anything. Some councillors are starting to understand things from an economic perspective, but they are still a minority. Unfortunately, many councillors have decided that it is politically dangerous to take any position, so they say "maybe" - or say nothing at all - and spend time replying to fence disputes in order to make neighbours think that they are paying attention to their ward, meanwhile they neglect to consider the entire city! 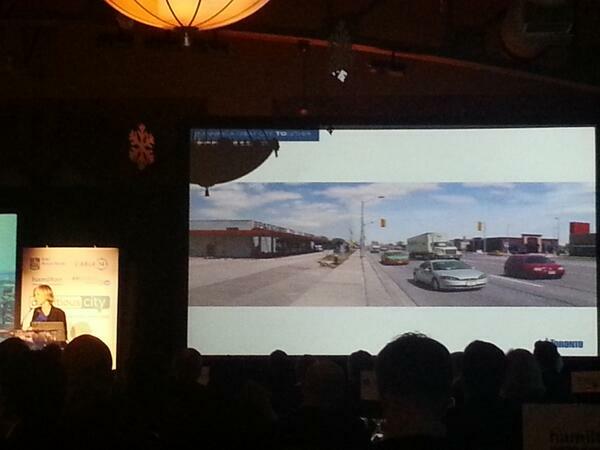 Every innovative project in Hamilton comes pre-installed with an "exit ramp". Our unfortunate reality here in Hamilton is that we have a Council composed almost entirely of career municipal politicians (when exactly did it become a job for life? )who do nothing but ward heel and pander to those who will re-elect them. Almost all care of nothing beyond the boundary of their own wards. History will judge them and their legacy. Sadly, none of them care about that. They don't care about leaving a legacy while in a position to do so. They certainly won't care once they're dead. Keesmat also said that we get the government we deserve. People have elected the council we have and that says something about the way people think things should be done. Keesmat also talked about how she works in Toronto to build capacity and share the message. While it may seem that "we" have heard it a million times before, many people outside the core have yet to really hear this message. Perhaps we need to consider going to them to share this rather than asking them to come to us. As I've said on this forum before, I believe now is the time to strategize and begin to promote the merits of core development, complete streets, LRT, bike paths, etc., etc., to the voters who live outside wards 1 thru 3. Unless they're informed of the reasoning behind our wants, and what's in it for them, non-lower City voter will likely, once again, elect reps who just "don't get it" and we'll be mired where we are, or in worse shape, for yet another term. We need to get the message to the masses, not only the converted and convinced. Kelly's suggestion of taking the information to the naysayers is a great one: Only we can NOT go armed with stats and figures and graphs, we need to go armed with a narrative - we need to tell a story about how a great downtown will be great for everyone, or more precisely how a struggling downtown hurts everyone. I also liked Jennifer's comment about how we're subsidizing sprawl still, and how much that's hurting the entire city. In the last municipal election in Calgary, progressive candidates calculated how much money suburban sprawl was costing each existing home-owner in the city (something like $440 a year in extra property taxes to cover charges that were unfunded by development fees) and hammered away at the message. As a result, the shape of Calgary's city council is beginning to change dramatically away from sprawl-supporting Aldermen who are 'owned' lock, stock, and barrel by developers, to more progressive voices that are beginning to make real change. It's a tactic that progressive candidates in the next election (myself included) would do well to emulate in Hamilton. Downtown is perfect for retirees too. Thanks so much for sharing this. I really wanted to attend this event but the $50 price tag put it out of reach. Your summary is informative and inspiring. Here's hoping Hamilton outhustles other cities and attracts more than our share of 18-34 year olds (have to assume we're after well educated, highly skilled, employed and top earning young professionals with loads of disposable income and a preference for downtown condos and gentrifying neighbourhoods). While it's too early to know how that competition will play out, we should bank on having a whole lot more seniors. Our city's far more likely to get older than younger. Some seniors will be the picture of health and wealth, hitting the bike paths, hopping on the LRT, doing monthly Art Crawls and spending $6 for a loaf of artisinal bread at "Seven Thieves" style high-end retailers in restored historical buildings that Jennifer highlighted yesterday. But there will be seniors with health and mobility issues. Seniors who want to stay in their suburban homes or move to suburban retirement communities. Seniors on fixed incomes who stretch their limited buying power by shopping at big box stores that have yet to set up shop downtown. It's no surprise that young professionals living and working in the lower city want an increasing share of public and private sector investment in their backyard. It will be interesting to see what seniors outside the core want, how they vote and what sway they'll have on politicians. Jennifer's said it before and it's a message complete street advocates here should adopt and start hammering home. Making Hamilton a great city for seniors will make Hamilton a great city for everyone. In making investments and improvements downtown, we should be asking will this make life easier and better for our seniors. Intentionally or accidentally framing the stakes as downtown Millennials versus suburban grandparents will do nothing to unite Hamilton, move us forward and make our city great. We need more creative industry investment. And, slowly, I think its happening. But, I'm writing this from my desk here at the largest Ad Agency in our region...in Burlington. A city 1/3 the size - with the only real benefit of being slightly closer to Toronto. Downtown Hamilton could have, and, can, moving forward, be made more comfortable for these businesses -- who thrive on the 25-40 folk. Generally (and, I have to use my Toronto experience in my industry as reference -- due Burlington hindrances mentioned above), these people want the lively, urban environment with the retail, entertainment options and other amenities that go with it. Ideally, that means easily accessible on foot and/or reliable, clean and safe transit. It means making things like the Gore Park promenade the rule, rather than the exception. Those are the small things that start to make downtown a more friendly environment that businesses can showcase as recruitment tool. That leads to greater investment, more jobs, and a greater retention of those graduating from Mohawk and Mac. GET OUT OF MY WAY, I"M A MOTORIST! Some of those seniors are losing their ability to drive. The problem is that nobody expects or plans to lose their license, but it happens eventually and nobody likes to think that far ahead. The mantra of the complete streets movement is to build 8-80 cities - the idea that cities that are safe, healthy, and liveable for 8 year olds and 80 year olds will be good for everyone. The only people I've seen framing the debate as downtown millienials vs. suburban grandparents are the squelchers who seek to discredit complete street proponents by portraying them as effete, latte-sipping, art-gallery sitting, urban elitists. Nothing could be further from the truth of course. Perhaps it is the status quo proponents advancing this false dichotomy who could stand to be lectured on their poor choice of narrative. exactly. 8-80 is the goal. For all the squelchers, the goal is their own mini-Indy 500 everyday home from work, and apparently it's fair and just that the rest of us suffer, and our city's economy suffer horribly to accommodate this daily few minute race. > But there will be seniors with health and mobility issues. And why, pray tell, do you think they will want to remain isolated in suburban prisons where it's not possible to get anywhere or see anyone or do anything without getting in a car and driving (or having someone drive them)? Cities are just as attractive to seniors as to younger adults, and for the same reasons: accessibility, diversity, social inclusion and quality of life. The only one "framing the stakes as downtown Millennials versus suburban grandparents" is you. Have you had a relative who's a senior in this situation? I have. They get comfortable. They don't want the change. My grandparents lived in Ancaster, in their home, for a long time before downsizing to a condo-sized place in Dundas. They just aren't interested in living downtown - they live where they are comfortable, where they grew up, and where they know the stores, the people, and their families. My grandparents were from Westdale, moved to Ancaster, and are now in Dundas. They are not interested in moving downtown where only I live, the rest of my family is in Dundas, Ancaster, and Burlington. Also, where are the big retirement homes in the core that are built in the last 5-10 years? The only one I know of is the converted hotel by Copps. Atrium Villa is farther east, but I have no clue to it's age. Build a large, condo style with attached community centre and maybe it'll attact seniors who can a) afford it, b) want to live in the area and c) have it close to amenities, and they will come. Well I know a few senior couples who have moved downtown since retiring and in both cases, it was the wife who pressured the husband to move. Losing the driver's license was a factor in at least one case, general desire for walkability the other. Walkability is going to be THE factor in many peoples' decisions to age-in-place or move. Suburbs are not going to be the place for seniors when they lose their mobility. It's a fact. what about those who are raised and live in downtown Hamilton? Are they second class citizens who don't deserve the option to downsize to a nice condo in their familiar surroundings in a safe, walkable environment when they are older? Or, are speeding trucks and folks from Ancaster cutting through more important than a safe, livable, vibrant community for people of all ages?? So they left Ancaster for a small (therefore central) condo sized place in Dundas? You just proved the GP's point. They left a sprawling suburb and moved into a walkable urban neighbourhood. That's the point. Hamilton is a diverse city and it has more than one downtown to live near. Royson's column gets a lot right, but it's a mistake to treat "downtown" and "the suburbs" as things ... since the 1980s the ethnic and socioeconomic profile of each within the City of Toronto has changed dramatically. Those penny-pinching suburbs that scrimped on social services and insisted on user-fees for recreation programs, that he talks about, have become places divided between lower-middle-class and middle-class homeowners and the working poor living in basement suites and tower blocks. The suburbs that Royson is talking about are experiencing decline and are stuck half-way between city and suburb ... they aren't fully urban or suburban (social and economically more urban, but physically more suburban). Despite the image that Rob Ford projects ... he won because he appealed to a sense of alienation that exists (or existed) amongst the working poor and struggling lower-middle class found on the edges of Toronto. I lived in South Riverdale/Riverside and was a "downtowner" at the time. Few people on my block could fathom him winning or even being taken seriously. I had spent time watching council and thought the "Tommy Boy" caricature was an apt one. But as the election approached I was doing work in Scarborough and I noted the difference in how people viewed the city there ... sure, some older people saw things in pre-amalgamation city-suburban terms. But even for many of them it was issue specific, they didn't like Ford, but also didn't like LRT or the way that urban intensification was being "rammed down our throats". David Miller became a stand-in for "downtown elites" (urbanists, planners, etc) who came out to their neighborhood to lecture them on how they had to change, and what that change had to look like. They voted against what they thought Miller represented, and not so much for Ford (he did a masterful job of constructing himself as the anti-Miller). For the newer working poor and lower-middle class residents, among whom a large proportion are immigrants and ethnic minorities, i don't think it registered the same way. They were upset with TTC fare hikes, the threat of transit strikes, overcrowded buses, unaffordable and poorly maintained rental housing, childcare shortages, and the seeming contempt and disdain that downtowners, who they saw as rich Canadians, had for their part of the city. Sadly, Miller was actually focused mostly on dealing with inner suburban problems ... Tower Renewal, Strong Neighbourhoods, and Transit City were all directed at addressing issues in the city's inner suburban districts. Consider the Toronto transportation department; it continues to apply policies that favour vehicular traffic above everything else, unaware of the fact that the city has turned into something entirely different, something its policies no longer support. Indeed, our transportation facilitators are now part of the problem, not the solution. This is evident throughout the city, where the battle between cars and trucks and everything else rages more fiercely than ever. Are our streets good for anything more than driving? If they’re not, then it’s time to change that or accept as inevitable that Toronto faces a future as a second-rate city of little consequence to the wider world. This won’t be just because of the design and organization of our streets, but because they are symptomatic of a larger mindset, a mindset that resists change and clings to outdated notions that have no place in the 21st century. Toronto’s reluctance to install something as simple as a pedestrian crossing speaks of the larger failure to grasp at the most basic level what a city is. From the half mayor down, we live in a state of collective denial; at this point, it’s not clear we even want to be a city. Instead, it seems many of us would rather exist in some kind of indeterminate suburban condition moving constantly between boxes — domestic, commercial or corporate, big or small — cut off from a world that has grown scary to too many Torontonians.